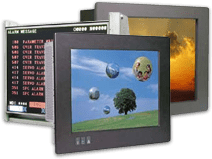 Dynamic Displays offers a wide selection of LCD retrofit monitors for the legacy Toshiba CRT monitors used in most Hitachi, Fanuc and Mazak controlled CNC machine tools. Our 9”, 12” and 14” LCD retrofit monitors replace your original Toshiba monitor, offering long life expectancy and superior reliability with perfect fit and performance, giving you crisp, clear images for years to come. The Toshiba monitor replacement table shows Dynamic Displays current offerings for your CNC equipment. Dynamic Displays has specifically designed several industrial Retrofit LCD monitor models to be your next Toshiba CRT monitor replacement. Don’t bother repairing your old, worn out Toshiba CRT monitor or purchasing a refurbished CRT replacement with a very short life expectancy. Our Toshiba LCD replacement solutions are brand new, in stock, LCD displays that provide a sharp clear image, are manufactured in the USA, and carry a two year parts and labor warranty. If we don’t have a standard Toshiba CNC replacement LCD display already designed for your particular CRT monitor model, our engineering staff will be happy to customize a rugged LCD display to meet the unique CNC Toshiba monitor specifications and extend the life of your production equipment.